I was sitting at an extendable table and, half-bored, wrote the words “extendable table” in my notebook. I then asked myself which artwork has a long table in it. 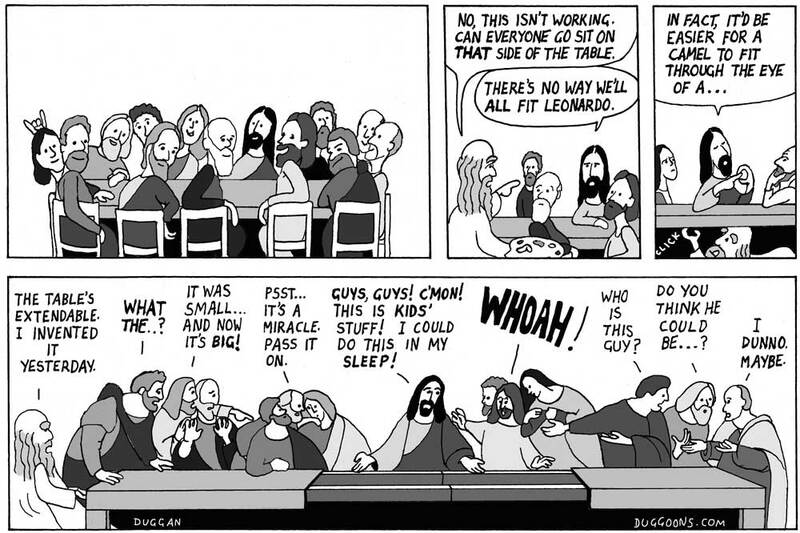 Leonardo Da Vinci’s “Last Supper” quickly came to mind. Sometimes you just stumble upon a premise that opens up such a rich vein of silly ideas you begin to wonder why cartooning ever seemed hard. The dialogue followed fairly naturally from the premise and led to several of those idiotic leaps of logic that really funny my tickle bone. Leonardo painting Christ and the apostles from life despite the nearly 1,500 year time difference is the main one. Leonardo put mind numbing levels of thought into all his paintings. The amount of work that went into each apostle’s expression, gesture and position in “The Last Supper is fairly common knowledge but something I didn’t know until recently was that the tapestries in the background (long since painted over) were arranged by Leonardo according to Pythagoras’ musical harmonic mean of 6, 4, 3, so that their widths are respectively a half, a third and a quarter of the size of the first as they recede into the background. I’m starting to think the guy was some kind of a genius. Knowing the level of detail he went to makes the cartoon Leonardo’s lacksadaisical ad-lib approach even funnier. Something that bugs me about the cartoon however are the “rabbit ears” in the first panel. I agonised about this. It looks good but is it over-egging a joke? Perhaps just the crap, overcrowded composition by itself is funnier. There’s something about one of the apostles not treating the posing seriously that nags me. Hmm. Once I had the science vs religion angle I wanted Jesus to say something profound but essentially meaningless in order heighten the contrast with Leonardo’s more practical approach. “It would be easier for a camel to fit through the eye of a needle than for a rich man to enter the kingdom of heaven” is incredibly harsh on bankers but is good for me as it has the word “fit” in it. I was actually quite surprised when I went looking for a famous Jesus quote. In view of his gigantic historical importance you would expect there to be loads of really famous sayings by him but strangely there isn’t. He’s a bit like Kate Moss like that. Keeping your gob shut is a good career move for a public figure. Keeps a bit of mystery. Right – that’s it! I’m not going to blog anymore. I’m shutting my mouth and going mysterious. You can all just wonder what I’m thinking. Maybe bathe in my aura if you want. Don’t worry – I won’t look because I don’t care. I’m aloof.